Social communication means transparency and feedback, and these are our values for a well-timed community management strategy. Communicating by using unilateral methods is such a mistake. Dubsar will be your community manager and will come up with the ideal strategy. We are eager to advise and manage your social media communication, so that your social marketing investment will improve its ROI. What is distinctive about our methods is that the community management and B2B branding initiatives can be directly tied to sales leads. We are totally flexible in our approach and will work with clients on a project, hourly or retainer basis – whatever fits your needs best. Prospective customers want to do business with people they know and trust. Positioning your company as a thought leader with valuable expertise makes you more attractive to the media, and more trustworthy to your clients and prospects. This is why you have to be more visible in the social media and create a reliable community of users, who comment and provide you with feedback to improve your success. Updating your profile, tweeting relevant information and uploading some pictures of the events merely represent a part of the community management strategy. You have to step up your presence on the social media. Our firm can help position executives within your company as authorities on a particular topic due to their profiles in social networks. Transparency and visibility are two basic rules for managing online communities. You do not have to communicate everything, but all the activities related to your company may enhance the flow of communication between customers and your company. We know how to manage social networks and how to be effective with your online communities. We have a proven-track record and we have developed a broad strategy to implement social media communities within your company. Updated Facebook, Twitter and Linkedin profiles of your company. News feeds for your online community. Management of your communities to generate feedback. Positioning your company through social media. Enhanced visibility while drawing your company closer to your customers. Dubsar had a key role in our business success. They set up the basis for a solid social media strategy, which is now one of our brand strenghts. 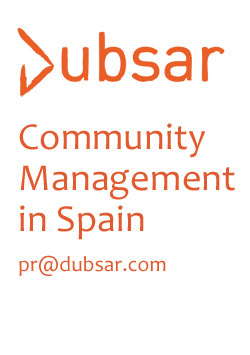 Looking for a community manager in Spain? What is distinctive about our methods is that the community management and B2B branding initiatives can be directly tied to sales leads. We are totally flexible in our approach and will work with clients on a project, hourly or retainer basis. Updating your profile, tweeting relevant information and uploading some pictures of the events merely represent a part of the community management strategy. You have to step up your social media presence and we do want to help you.